Look no further for cooking inspiration. Maria Hoyle samples the latest must-reads for the savvy cook. The seventh cookbook from the chef-patron of the Ottolenghi delis and NOPI restaurant spells out - quite literally - the art of exceptional cooking. Each of the 130 dishes is categorised by one or more of the letters of ‘SIMPLE’. S – Short on time; I – 10 ingredients or less; M – Make ahead; P – Pantry; L – Lazy; and E – Easier than you think. So Sweet Potato Mash with Lime Salsa is ‘I’ (just 5 ingredients); Lamb Bake with Tahini Sauce is ‘M’ (prepare ahead); Chicken Marbella is ‘I, M and L’ – one to make ahead and just throw in the oven. Whatever your idea of no-fuss cooking, this is a kitchen must-have. Pure and simple. In Always Delicious, the doyenne of New Zealand food writing brings together 100 of her favourite recipes from column in the NZ Listener. A new cookbook is always a treat, but there’s something especially delicious about one that sings the praises of our homegrown produce and artisans. 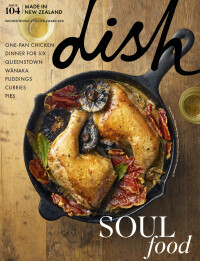 Lauraine’s latest offering is just that; she’s an ardent champion of the New Zealand food scene, especially small producers, regional specialty foods and farmers’ markets nationwide. The book is divided into six sections: sensational salads and vegetables, savoury dishes, fish, meat, sweets and desserts – all beautifully complemented by Liz Clarkson’s superb images. With notes on the best season to prepare each dish, this is a simple but sophisticated collection that embraces all things New Zealand. What’s not to love. This Melbourne food blogger’s loving homage to the cuisine of her father’s homeland is steeped in local knowledge, tradition and nostalgia. Paola – who returns to Italy every year to reacquaint her palate - takes us along the Adriatic coast, chronicling the different eating styles along the way. “Vegetables dominate the traditional cuisine of the Gargano”; on the Conero Riviera “the food is richer than the more southern part of the Adriatic”. Dishes that reflect the diversity of terrain and ingredients include Beef Goulash Trieste Style; Tagliatelle with Porcini and Clams; Fish and Potato Stew; and Venetian Apple Cake. Bellisimo. Both cookbook and appetiser, New York Capital of Food leaves you with a distinct craving for a big juicy bite of the Big Apple. The collection draws inspiration from Duke Ellington’s song Take the A Train, about New York’s oldest subway line, whisking you off on a morning-to-night gastronomic tour – from breakfasts through to evening drinks at a rooftop bar. You’ll be tempted by the likes of Jewish Espresso Meringues, and iced Blueberry and Cream Cronuts so glistening they might have been buffed by a sidewalk shoeshiner. You’ll lick your lips over Tuna Pretzel Bagels and a multi-storey Pastrami Sandwich stack. You’ll drool over Colombian arepas, Asian risotto, Shakshuka and Pierogi. Nothing groundbreaking here… just good, hearty food with a lot of escapism thrown in. Bon appetit… and voyage.